I know for a fact that my first finished garment of 2016 is going to become a very well-loved skirt, but making it was a lesson in how I should always get used to a new-to-me fabric by practicing techniques on scraps before venturing into the real deal. 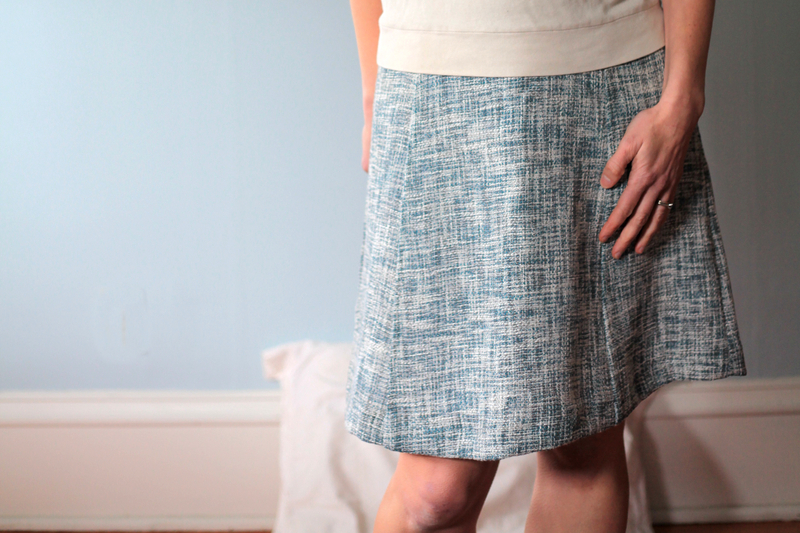 A lesson that, of course, I didn’t learn until I was half way through making this skirt. The new-to-me fabric is an Oscar de la Renta gray and teal cotton-rayon woven that came from Mood Fabrics. This teal color way is no longer available online, but the black-and-white color way still is. It’s a beautiful loosely woven fabric that seems to be made from lofty white thread that’s been wrapped in either a fine teal or a fine gray thread. The teal and gray threads are sometimes wrapped very densely, creating a wiry thread in their respective color, or wrapped very loosely, releasing the lofty white thread underneath. Together these threads create a textural weave in a seemingly random pattern of teal, gray, and white. The textural quality of the fabric reminded me of a favorite red A-line skirt I made a few years back from the free skirt pattern that came with the no-longer-available Craftsy class Sew Retro: The Starlet Suit Jacket. I get a lot of wear out of that skirt, so I figured it was worth giving it another go. Since the red skirt still fits me well, I jumped right in and started cutting the teal fabric. However, I quickly learned that the previous red fabric and this new teal fabric are very different in nature. I noticed right away that the loose weave meant this new fabric liked to unravel at the raw edges. I’ve never worked with a fabric with this type of loose weave. In hindsight I should have paused and done a little reading on how to best handle it, but I didn’t think of slowing down at the time. Instead I made sure to handle each piece very delicately to minimize fraying. I think I had a decent amount of success, though the hem took the worst beating since it was left raw the longest. Thankfully, it was easy enough to clean up the hem before machine blind stitching it in place. It just means this skirt is slightly shorter than my red version. Hello knees! Since the hem had to go above the knee, I was trying to aim for that little place above the knee where it narrows before the thigh starts. Maybe I got close? I still find the rules and lengths of hemming so hard to get right. I’ve learned that I can’t just mark straight on my dress form since it doesn’t have enough bum to get the back hem right (something I should remedy by adding a little padding to my dress form!). I’ve also learned that my husband and I can demo and start to rebuild a kitchen together, but try to work together to get a skirt hem right? Not a chance! I even bought one of those skirt hem ruler guides, yet I mostly wing it with pins and a mirror. On the plus side, the length seems to create a nice one-third-top-to-two-thirds-bottom ratio when I tuck my shirt into the skirt. Maybe not quite the perfect golden ratio since I learned years ago that my ideal golden ratio measurement says my skirt should end just below my knee. However, I often leave my shirts untucked, creating what I learned from these photos is more of a one-to-one ratio between top and bottom. Untucked isn’t bad, but I’m a fan of the rule of thirds and will have to remember that I’m closer to achieving it when I tuck my shirt in! Stitching the skirt together was fairly straightforward, only my machine didn’t like the densely wrapped teal and gray threads. Slowing down my stitching seemed to help my machine ease through them though. And, while everything ended up fine in the end, my biggest regret is that I finished the raw edges by serging them. Remember above when I said I wish I practiced all of the sewing techniques I planned to use on scraps before venturing into the real deal? So far I’d at least been able to adjust my sewing on the fly to what I was learning about the fabric – treating the fabric delicately to limit fraying of the raw edges, slowing down my sewing to keep my sewing machine happy through the densely woven threads… But, figuring out how to best finish the raw edges using scraps would have been really helpful. Since I was so worried about the raw edges unraveling, I ran my skirt over to the serger as quickly as I could after sewing the first seam. My serger is my go-to seam finisher. Only, trying to bind the loose weave of this fabric in serger thread is not pretty. At least not with my skill level at the serger! Once I sent a raw edge through the serger, I felt committed. And, I couldn’t really figure out a way to adjust my serging to make things any better. I did my best though, and none of the raw seams are unraveling inside, but I sure didn’t do this lovely fabric any justice. For the closure I hand stitched a lapped zipper in the skirt. In the waistband I decided I wanted to use a button instead of a hook-and-eye after finding a fun, coordinating teal coconut button on Mood’s site. After my lesson with the serger, I did practice the button hole on a scrap of fabric that I interfaced the same as the actual waistband. The result wasn’t my prettiest buttonhole ever, but it didn’t fall apart as I had begun to worry it might after all that I’d learned about working with this loose-weave fabric. So, I went ahead and added a buttonhole to the actual waistband. The button was hand sewn on in matching thread. I like the little bit of whimsy a fun button adds to an otherwise plain skirt like this one. Finally, I lined the skirt with some Bemberg rayon that I had left over from my Colette Beignet skirt, a skirt that was eventually scrapped since after a few wears I realized I hadn’t fit it properly for my high waist – I liked it in the photos, but it just didn’t wear right. It’s pretty much the only thing from my 2012 SWAP that hasn’t stood the test of time. Case in point: the Renfrew I’m wearing in these photos was also in that SWAP. It gets worn a lot when the weather cools. Despite all of the lessons that I had to learn with this fabric, I really like it. I’m tempted to get the black-and-white version so I can have another go at it. This fabric has a nice amount of body to it and could hold some interesting shapes. Maybe a lined jacket?! So, there you have it. My first finished garment of 2016. A new favorite skirt that I trust will get a lot of wear. And, from it a valuable lesson to take with me throughout the rest of the year (and beyond! ).